Summary: Whether you are searching for new supplements for your beading operations or looking for some new jewelry making findings, you deserve our New Huge Annual Clearance Promotion. 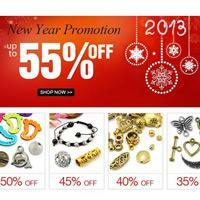 From beads and charms to findings and kits, we prepare more than 10,000 items at discount up to 55%. Get the chances before they are gone! Old year ends and brand new year is coming. Have you get ready to step into the new 2013? However, on the occasions of cherry Christmas Day and New Year Day, I on behalf of all our staffs definitely wish you and yours a Happy Holiday. 1. Valid Time: December 11th 00:00, 2012-January 10th 24:00, 2013. 2. You can’t enjoy accumulative order discount and single order discount declared in Discount Policy at pandahall. 3. Each item has limited quantity for promotion, and will back to original price whenever sold out. Click the picture for more promotional product categories. Any question about the Sales Promotion or Discount Policy, please feel free to contact us at all times. Browse now before chances are gone forever!